Burkholderia pseudomallei is the causative agent of melioidosis, a tropical disease of humans with a variable and often fatal outcome. In murine models of infection, different strains exhibit varying degrees of virulence. In contrast, two related species, B. thailandensis and B. oklahomensis, are highly attenuated in mice. Our aim was to determine whether virulence in mice is reflected in macrophage or wax moth larvae (Galleria mellonella) infection models. 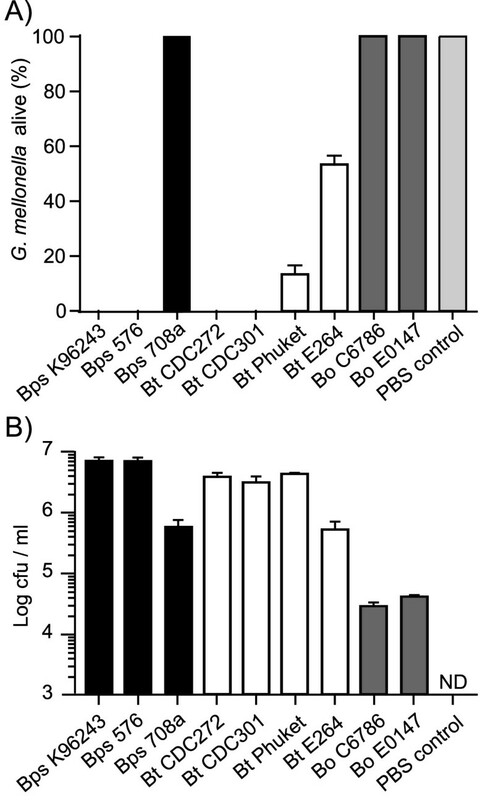 B. pseudomallei strains 576 and K96243, which have low median lethal dose (MLD) values in mice, were able to replicate and induce cellular damage in macrophages and caused rapid death of G. mellonella. In contrast, B. pseudomallei strain 708a, which is attenuated in mice, showed reduced replication in macrophages, negligible cellular damage and was avirulent in G. mellonella larvae. B. thailandensis isolates were less virulent than B. pseudomallei in all of the models tested. However, we did record strain dependent differences. B. oklahomensis isolates were the least virulent isolates. They showed minimal ability to replicate in macrophages, were unable to evoke actin-based motility or to form multinucleated giant cells and were markedly attenuated in G. mellonella compared to B. thailandensis. We have shown that the alternative infection models tested here, namely macrophages and Galleria mellonella, are able to distinguish between strains of B. pseudomallei, B. thailandensis and B. oklahomensis and that these differences reflect the observed virulence in murine infection models. Our results indicate that B. oklahomensis is the least pathogenic of the species investigated. They also show a correlation between isolates of B. thailandensis associated with human infection and virulence in macrophage and Galleria infection models. Burkholderia pseudomallei is a facultative intracellular pathogen responsible for melioidosis, an infectious disease of humans prevalent in Southeast Asia and Northern Australia . Infections in humans may result in a wide range of clinical symptoms and manifestations [2, 3] and in some individuals the bacterium is able to persist with symptoms not shown until several years after exposure . B. pseudomallei has been shown to have a broad host range with disease reported in animals ranging from kangaroos to dolphins [5, 6]. However, in the laboratory, the mouse is the most commonly used infection model . Different strains of B. pseudomallei vary markedly in their virulence in murine models of disease. When given by the intraperitoneal (i.p) route, the most virulent isolates have an infectious dose of less than 50 colony forming units (cfu), whereas in the least virulent isolates the infectious dose is over 5,000 cfu . It is not clear whether these differences in virulence in mice are associated with the various clinical outcomes observed in humans. Whilst murine models of infection are valuable for understanding mechanisms of virulence, the behaviour of B. pseudomallei in cell culture systems has been used to characterise the intracellular lifestyle of the bacterium. B. pseudomallei has been shown to be taken up by professional phagocytes including mouse macrophage-like cell lines such as J774 and RAW264 [8, 9] and non-phagocytic cells including HeLa and A549 cells . More recently, other members of the Burkholderia genus including B. thailandensis and B. oklahomensis have been described as being closely related to B. pseudomallei [10, 11]. Indeed, until recently, B. thailandensis isolates were classified as B. pseudomallei . There is extensive chromosomal synteny between B. thailandensis and B. pseudomallei, although some virulence-associated genes which are present in B. pseudomallei are absent in B. thailandensis . Both B. pseudomallei and B. thailandensis are able to invade and grow in a range of phagocytic and non-phagocytic cells, forming plaques or multinucleated giant cells [13, 14]. However, there is also evidence that the behaviour of B. pseudomallei and B. thailandensis differs in different cell lines. In A549 and human dendritic cells, B. pseudomallei has been shown to be more invasive than B. thailandensis, but there were no reported differences in the growth rate within cells. In contrast, in human macrophages, differences in intracellular growth rates have been reported . Collectively, these findings have suggested that B. thailandensis could be used as a model to study certain aspects of the intracellular lifestyle of B. pseudomallei in cell culture systems . The behaviour of B. oklahomensis in cell culture models is not known. The value of whole animal or plant infection models, which use B. thailandensis or B. oklahomensis in place of B. pseudomallei, is much less clear. Isolates of B. thailandensis and B. oklahomensis that have been tested are considered to be highly attenuated or avirulent in BALB/c mice, with lethal doses for most isolates in excess of 107 cfu by the i.p. route . However, using intranasal challenge models, doses of greater than 104 cfu of B. thailandensis are reportedly able to kill mice and replicate B. pseudomallei disease phenotypes, although even in this model it is clear that B. thailandensis is much less virulent than B. pseudomallei . There has been significant interest in the development of alternative infection models which avoid the use of mammals but also reflect the differences in virulence of species and isolates seen in mice. The Caenorhabditis elegans  or tomato plant  infection models were not able to distinguish between B. pseudomallei and B. thailandensis, and in C. elegans, B. thailandensis was the most virulent . Galleria mellonella (wax moth) larvae have previously been reported as susceptible to infection with B. pseudomallei, and a single B. thailandensis strain tested was reportedly less virulent . This finding suggests that G. mellonella larvae may be a suitable host species for discerning differences in virulence. Our aim was to determine whether differences in the virulence of B. pseudomallei, B. thailandensis and B. oklahomensis isolates could be reliably determined in macrophage and G. mellonella larvae infection models. For this study we have selected a range of B. pseudomallei, B. thailandensis or B. oklahomensis isolates of known ancestry. The properties of these isolates and their virulence in murine models of disease is summarised in Table 1. The intracellular replication profiles for each isolate were initially determined in a cell culture model using murine macrophages. This was performed using a modified intracellular replication assay where 250 μg/ml kanamycin was used to kill extracellular bacteria, as validated below. Initially, the minimum inhibitory concentration (MIC) of kanamycin for each strain was determined and found to be 16-128 μg/ml (Table 1). All of the strains tested were unable to grow in the presence of 250 μg/ml kanamycin in broth. Similarly, supernatants of J774A.1 cell cultures containing 250 μg/ml kanamycin and infected with any of the strains did not contain viable bacteria when samples were plated onto agar. To test for harmful effects of kanamycin on eukaryotic cell lines, cell toxicity assays (LDH assays) were carried out on culture supernatants from uninfected J774A.1 cells that had been cultured in the presence of 250 μg/ml kanamycin. There was no significant difference between the LDH levels of these culture supernatants compared to control supernatants from J774A.1 cells cultured in the absence of kanamycin (data not shown). Burkholderia isolates used in this study. Description of the Burkholderia strains used in this study, their susceptibility to kanamycin as described by the minimum inhibitory concentration (MIC) and a summary of published data on virulence of these isolates in mice described as the median lethal dose (MLD) in colony forming units or as number of survivors. The first parameter that was assessed in the macrophage model was internalisation efficiencies of the Burkholderia strains. Bacteria released from J774A.1 macrophages lysed 2 hrs post infection were enumerated on agar plates and compared to the input number. There was no significant difference between the degree of internalisation of B. pseudomallei, B. thailandensis or B. oklahomensis into murine macrophages (Figure 1A). Bacterial uptake, intracellular survival and replication of Burkholderia strains in mouse macrophages. J774A.1 macrophages were exposed to Burkholderia strains at an MOI of 10 and the mean numbers of intracellular bacteria were determined at 2, 4, 6, 8 and 12 hrs post infection. (A) Uptake of bacteria by macrophages as determined by bacterial counts 2 hrs post infection relative to the input numbers. 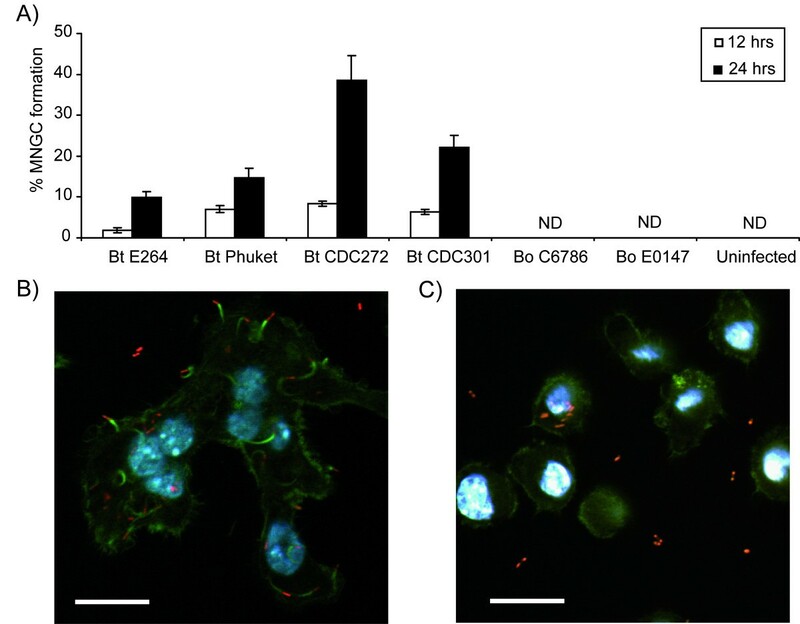 (B-D) Intracellular survival and replication of B. pseudomallei (Bps; panel B), B. thailandensis (Bt; panel C) and B. oklahomensis (Bo; panel D) in J774A.1 macrophage cells. Error bars represent the standard error of the mean. All infections were performed as three independent experiments, each with three technical replicates. The insert in panel C represents individual bacterial counts and the mean value at 12 hrs post infection with different B. thailandensis strains. Next, intracellular replication was measured at 2, 4, 6, 8 and 12 hrs post infection. 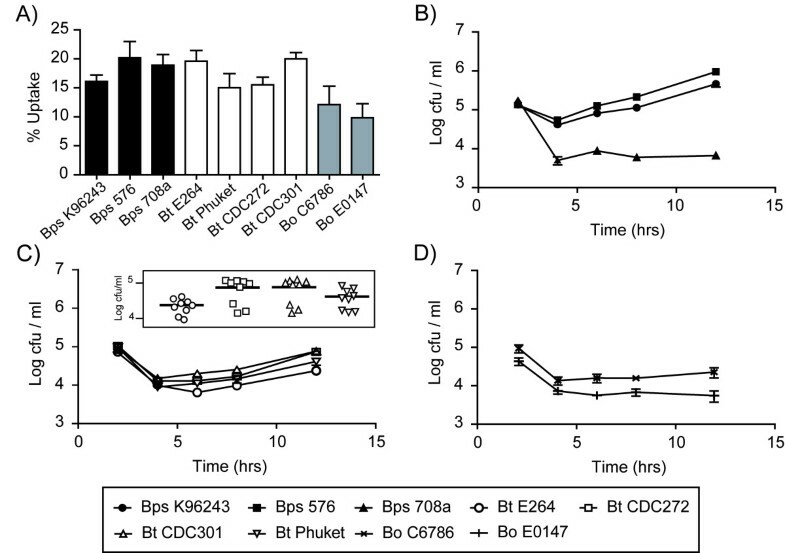 There was a significant difference between the numbers of intracellular B. pseudomallei strains 576 and K96243 at 12 hrs post infection (P = 0.002; Figure 1B) and both were significantly higher than numbers of intracellular B. pseudomallei strain 708a and any of the B. thailandensis or B. oklahomensis strains tested (P < 0.002, both). Bacterial numbers were over 10-fold lower with any of the B. thailandensis or B. oklahomensis strains tested (compare Figure 1B to Figure 1C&1D). To test whether the low numbers of intracellular bacteria observed with B. pseudomallei 708a, which is more sensitive to kanamycin, was a consequence of low levels of antibiotic crossing the eukaryotic cell membrane, J774A.1 cells were infected with B. thailandensis DW503 (an amrAB-oprA efflux pump mutant and therefore highly sensitive to kanamycin) and intracellular bacterial numbers were compared to its parental strain E264. The numbers of bacteria isolated at each time point were not significantly different between strains E264 and DW503 (data not shown). Our results also showed variance between the patterns of growth in macrophages of different isolates of B. thailandensis. The B. thailandensis strains previously isolated from cases of human disease, CDC272 and CDC301, showed increased numbers at 12 hrs post infection relative to B. thailandensis E264 (P < 0.004, both; see insert in Figure 1C) and the two B. oklahomensis strains C6786 and E0147 (P < 0.009, both), but not B. thailandensis strain Phuket (P > 0.05). To show that these differences in bacterial numbers were due to differences in intracellular replication and survival rather than a difference in bacterial fitness, growth rates of bacteria in antibiotic free media were compared. There was no significant difference between any of the strains tested (data not shown). The ability to cause cellular damage is often used as an indicator of bacterial virulence. Cellular damage can be measured by the release of lactate dehydrogenase (LDH) from dead or dying cells. J774A.1 macrophages were challenged with bacteria and LDH levels in supernatants were measured at 12 and 24 hrs post infection. At 12 hrs, LDH levels were relatively low and there was no significant difference in the levels of LDH released from cells infected with any of the bacteria tested (data not shown). However, at 24 hrs, the levels of LDH in the supernatants of cells infected with B. pseudomallei strains 576 or K96243 was higher than the LDH levels in cell supernatants infected with other Burkholderia strains (P < 0.03, both; Figure 2). Supernatants from cells infected with B. thailandensis strains CDC272, CDC301 and Phuket contained elevated levels of LDH relative to uninfected controls, but supernatants from cells infected with B. pseudomallei 708a, B. thailandensis E264 or either B. oklahomensis strain contained negligible levels of LDH. Cellular damage in macrophages caused by invasion of Burkholderia as measured by LDH release. J774A.1 macrophages were infected with Burkholderia strains at an MOI of 10 as already described and culture supernatants were analysed at 24 hrs post infection. The release of lactate dehydrogenase (LDH) from damaged or lysed cells was measured as described in the method section using a calorimetrical assay. Supernatants from uninfected macrophages were used to obtain a background OD 490 nm value, which was subtracted from the sample measurements. The error bars represent the standard error of the mean derived from three independent experiments, each performed in three technical replicates. ND = not detected. B. pseudomallei has previously been shown to form multinucleated giant cells (MNGCs) upon invasion of macrophages . Here, B. thailandensis and B. oklahomensis strains were tested for their ability to form MNGCs after infecting J774A.1 macrophages. A cell was considered to be a MNGC if there were 3 or more nuclei present. B. thailandensis was able to induce MNGC formation in a strain dependent manner. B. thailandensis strains CDC272 and CDC301 were most effective at causing MNGC formation (Figure 3A). In contrast, B. thailandensis strain E264 was poor at causing the formation of MNGCs and the B. oklahomensis strains tested did not appear to induce MNGC formation beyond uninfected background levels. A representative confocal microscopy image of a MNGC formed by B. thailandensis is shown in Figure 3B. MNGC formation and intracellular behaviour of Burkholderia strains in macrophages. J774A.1 macrophages were infected with Burkholderia strains at an MOI of 10 as already described. (A) Multinucleated giant cell (MNGC) formation was assessed at 12 hrs and 24 hrs post infection. Cells were stained with Giemsa and the percentage of MNGCs was calculated relative to normal macrophages per field of view. MNGCs were defined as cells containing 3 or more nuclei. The error bars represent the standard error of the mean derived from at least 10 fields of view. ND = not detected. (B-C) Representative confocal micrographs of cells at 8 hrs post infection with B. thailandensis strain E264 (B) and B. oklahomensis strain C6786 (C). In both panels, bacteria appear red due to expression of RFP from the modified broad-host-range vector pBHR4-groS-RFP. Filamentous actin was stained green with FITC-phalloidin conjugate and nuclei were stained with DAPI. Scale bars represent 20 μm. Actin-based motility on infection of eukaryotic cells has previously been demonstrated for B. pseudomallei [20, 21] and B. thailandensis strain E30 . To determine whether other B. thailandensis strains and B. oklahomensis are also able to migrate using actin-based motility, J774A.1 macrophages were infected with strains that expressed red fluorescent protein from plasmid pBHR4-groS-RFP. In preliminary studies, we showed that the presence of the plasmid did not affect the growth of the bacteria in LB broth or inside macrophages, and the plasmid was stably maintained for the course of the intracellular replication assay. At different time points post infection, macrophages were stained with Phalloidin conjugated to FITC and analysed by confocal microscopy. Both B. thailandensis and B. oklahomensis were visualised in the cells. Actin tails were visible and associated with B. thailandensis (Figure 3B) but were not visible in B. oklahomensis infected cells (Figure 3C). Galleria mellonella (wax moth) larvae were challenged with approximately 100 cfu of B. pseudomallei, B. thailandensis or B. oklahomensis and survival was recorded at 24 hrs post-challenge. B. pseudomallei strains 576 or K96243 caused 100% mortality, but no deaths were observed after challenge with B. pseudomallei 708a (Figure 4A). Challenge with B. oklahomensis strains C6786 or E0147 also did not result in death of the larvae at 24 hrs post infection. The B. thailandensis strains showed different degrees of virulence in this model. 100% mortality was recorded after challenge with B. thailandensis CDC272 or CDC301. Challenge with B. thailandensis Phuket or E264 resulted in mortality of approximately 80% and 50% of larvae, respectively (Figure 4A). At 20 hrs post challenge, just prior to the onset of paralysis and death, larvae were sacrificed and the number of bacteria in the haemocoel was enumerated. For all of the strains tested, the bacterial numbers at 20 hrs post infection were higher than the input number (Figure 4B). Similar to the cell culture model, B. pseudomallei strains 576 and K96243 and B. thailandensis strains CDC272, CDC301 and Phuket showed increased bacterial numbers relative to B. pseudomallei 708a, B. thailandensis E264 and both B. oklahomensis strains. To show that live bacteria are needed for killing of G. mellonella, B. thailandensis CDC272 or CDC301 were inactivated by heating to 80°C for 1 hour and then injected into G. mellonella larvae at the same concentration as live bacteria. After 24 hrs, all larvae infected with heat killed bacteria were still alive, whereas those infected with live bacteria had all died (data not shown). Virulence and intracellular survival of Burkholderia strains in Galleria mellonella larvae. Groups of 10 insect larvae were challenged with 100 cfu of different strains of Burkholderia as described in the method section. A) Percentage of surviving larvae at 24 hrs post infection. B) Number of bacteria present inside the haemocoel at 20 hrs post infection (calculated as cfu/ml). In both panels, results are shown as means and standard error of the mean of three independent experiments. B. pseudomallei = black bars; B. thailandensis = white bars and B. oklahomensis strains = grey bars. ND = not detected. At higher challenge doses of 10,000 cfu bacteria, all of the strains caused 100% mortality of the cohort of larvae at 24 hrs post injection, except B. pseudomallei 708a, B. thailandensis DW503 and B. oklahomensis E0147. At lower inocula of 10 cfu bacteria, all of the B. pseudomallei strains were able to kill G. mellonella by 72 hrs post challenge, but no dead larvae were recorded up to 5 days after challenge with B. thailandensis or B. oklahomensis. In this study, we set out to identify inexpensive alternative infection models that would reflect the virulence of B. pseudomallei, B. thailandensis or B. oklahomensis in mice and the association of these isolates with human disease. We have chosen B. pseudomallei isolates with different degree of virulence in mice, with strain 576 representing one of the most virulent isolates tested to date, and 708a one of the least . B. thailandensis and B. oklahomensis are not normally considered to be human pathogens. However, occasional cases of disease do occur. We have included clinical isolates of B. thailandensis in our study alongside B. thailandensis isolates that have not been associated with disease (E264 and Phuket), as well as clinical isolates of B. oklahomensis. In general, our results confirm that cell culture or Galleria infection models can be used to discriminate B. pseudomallei, B. thailandensis and B. oklahomensis isolates and these results parallel those found in mice. With the exception of strain 708a and compared with B. thailandensis and B. oklahomensis isolates, the B. pseudomallei isolates we tested grew more rapidly in macrophages, caused a greater degree of cellular damage and caused greater mortality of G. mellonella larvae. The B. oklahomensis isolates we tested were the least virulent in all of these models. Our finding that we are able to distinguish between B. pseudomallei and B. thailandensis isolates on the basis of their virulence in G. mellonella indicates that this model has a greater utility for the identification of virulence factors than the C. elegans  or tomato plant  infection models. There were some important differences in the relative virulence of isolates within each species in our models which are not reflected in mouse virulence data. In our macrophage and G. mellonella models, B. pseudomallei 708a was highly attenuated, to a level similar to that of the least virulent B. thailandensis isolates and both of the B. oklahomensis isolates. However, B. pseudomallei 708a is reported to be significantly more virulent than any B. thailandensis and B. oklahomensis isolates in mice [7, 16, 23]. B. pseudomallei 708a is a naturally occurring gentamicin sensitive isolate that, when compared to B. pseudomallei K96243, contains a 131-kb deletion within chromosome I . This deletion removes the amrAB-oprA operon providing aminoglycoside resistance, which explains the low MIC of kanamycin for this strain (Table 1). The deletion also results in loss of genes coding for the anaerobic arginine deiminase pathway, clusters encoding cobalamin and malleobactin iron uptake systems, and a putative type-1 fimbrial gene cluster . Transcriptome data obtained from B. pseudomallei K96243 at day three after intranasal infection of BALB/c mice showed that genes involved in iron acquisition, including the malleobactin operon, were induced in vivo compared to bacteria grown in vitro in LB broth (C. Müller, unpublished data). The same genes are also upregulated under low iron conditions [24, 25], which suggests that B. pseudomallei encounters iron limited conditions in the mouse model of infection. The absence of these siderophore systems in strain 708a might also partly explain the observed intracellular replication defect in macrophages (Figure 1B). Overall, and bearing in mind the genome plasticity of B. pseudomallei , we cannot be certain that the B. pseudomallei 708a isolate we have used in our study was genetically similar to the isolate previously tested in mice. It would therefore be valuable to re-test the B. pseudomallei 708a isolate we have used for virulence in mice. We also identified differences in the virulence of B. thailandensis isolates, which were consistent between our macrophage growth, macrophage killing and G. mellonella models, but not with previously reported data on virulence in mice or hamsters. In our models, CDC301 and CDC272 were the most virulent isolates, whereas CDC301, E264 and Phuket were most virulent in mouse and hamster infection models . A recent study revealed that both CDC strains belong to the same sequence type and are part of a distinct phylogenetic subgroup of B. thailandensis isolates that is separate from strains isolated in Thailand . Moreover, a strain belonging to the same subgroup as the CDC strains was shown to have an increased ability to replicate in macrophages compared to strain E264, in agreement with our data presented in Figure 1C. The same study  revealed that CDC301 encodes a gene cluster with 94% nucleotide similarity to the capsular polysaccharide biosynthesis cluster of B. pseudomallei, which has been shown to play a role in virulence in mice and in hamsters [28, 29]. However, our observation that strain CDC272, which does not express the Bp-like capsular polysaccharide, is as virulent as strain CDC301 in the G. mellonella model suggests that the capsular polysaccharide cluster is not required for virulence in insects. Overall, our results show that human clinical isolates of B. thailandensis are more virulent in macrophage and G. mellonella models, and the proposal that clinical B. thailandensis isolates from the USA are less virulent than SE Asian isolates  is not borne out by our data. At this time it is not clear whether murine, hamster, macrophage or G. mellonella models reflect virulence of these isolates in humans. Our finding that the B. oklahomensis isolates have low virulence in macrophage or G. mellonella models is consistent with the report that these isolates exhibit low virulence in murine or hamster models . Our work also identifies some possible reasons for this. Although we were able to visualise RFP-labelled B. oklahomensis cells in macrophages, we did not observe actin tail formation, suggesting that the bacteria would not be able to spread from cell to cell in the same way as B. thailandensis or B. pseudomallei [20–22]. MNGCs also failed to form in cells infected with B. oklahomensis, though this may simply reflect the inability of the bacteria to grow in J774A.1 macrophages. Actin-based motility in B. pseudomallei is dependent on BimA, which nucleates actin polymerisation . Our analysis of the B. oklahomensis shotgun genome sequences [Genebank accession numbers NZ_ABBG01000000 and NZ_ABBF01000000] indicated the presence of a BimA-like protein with 46% overall identity to its orthologue in B. thailandensis E264 (BTH_II0875), and 40% identity to the B. pseudomallei K96243 protein (BPSS1492). The last 160 amino acids of the BimA orthologues were found to be highly conserved between all species, whereas the N-terminus exhibited considerable variation. The B. oklahomensis BimA proteins contain B. mallei-like signal peptide and proline-rich domains and a B. thailandensis-like central acid domain, but seem to lack a WASP homology domain-2 . Therefore, it is not clear if B. oklahomensis BimA is functional in promoting actin polymerisation. Intracellular replication and endosomal escape of B. pseudomallei depends on the type III secretion system TTSS-3 , which is also present in B. thailandensis . Our analysis of the B. oklahomensis genomes revealed the presence of a TTSS3 gene cluster, with homologies of the encoded proteins ranging from 45% to 98% compared to the B. pseudomallei K96243 orthologues. However, two genes, BPSS1553 (bprP) and BPSS1554 (bprQ), which have recently been identified as ToxR and ToxS-like regulators encoded directly downstream of the TTSS in B. pseudomallei , are also found in B. thailandensis but are absent in the B. oklahomensis strains. BprP activates the expression of TTSS genes, and a bprP mutant in B. pseudomallei does not secrete TTSS effector proteins and is unable to kill macrophages . The absence of this activator in B. oklahomensis might therefore explain the low virulence of this species. In this study we have not tested Burkholderia mallei, another species closely related to B. pseudomallei, for virulence in cell culture or Galleria models. It is known that B. mallei is able to infect and grow in macrophages  and to kill G. mellonella larvae . However, the pathogenesis of B. mallei infection in G. mellonella may be quite different from the pathogenesis of B. thailandensis or B. pseudomallei infection we report here. Whereas we recorded larval death by 24 hrs post challenge with typical B. pseudomallei isolates, larval deaths occurred over the period 24 - 144 hrs post challenge with B. mallei . This might be explained by the restricted host range of the obligate intracellular bacterium B. mallei compared to B. pseudomallei with its much more versatile genome . 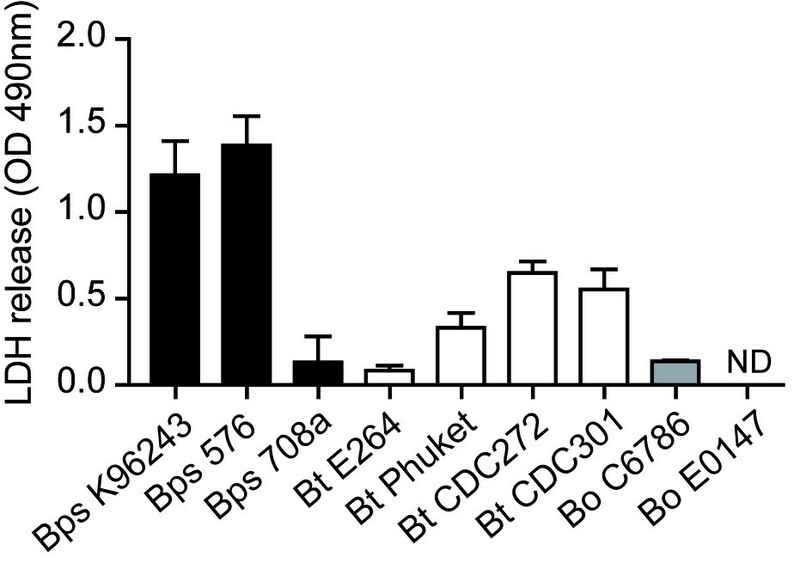 Our findings indicate that murine macrophage cell culture or Galleria infection models can be used to discriminate B. pseudomallei, B. thailandensis and B. oklahomensis isolates on the basis of their virulence. In general, our results support the proposal that the virulence of isolates in these models reflects virulence in murine models of disease. However, some important exceptions merit further investigation which is not within the scope of this study. Our finding that virulence of three B. pseudomallei isolates with high, intermediate and low virulence in mice is reflected in their virulence in cell culture or Galleria infection models indicates the potential value of these models for the identification of virulence-associated genes. Our findings support the proposal that B. oklahomensis isolates are of low virulence and indicate that these isolates are defective in growth in macrophages and in actin-based motility within cells. The Burkholderia strains used in this study are summarised in Table 1. All strains were grown in LB broth with aeration or on LB agar plates at 37°C unless otherwise stated. When appropriate, antibiotics (Sigma-Aldrich) were used at the following concentrations, unless otherwise stated: kanamycin, 50 μg/ml; chloramphenicol, 25 μg/ml; and gentamicin, 50 μg/ml. J774A.1 mouse macrophage cell lines were maintained at 37°C under 5% CO2 atmosphere in DMEM (Hyclone) supplemented with 10% fetal bovine serum (Hyclone), 1% L-glutamine (250 mM) (Hyclone) and 1% Penicillin/Streptomycin solution (Hyclone). The construction of the red fluorescent reporter plasmid used for confocal-laser scanning microscopy was performed in several steps. Firstly, a multiple cloning site (MCS) was introduced into the commercially available, mobilisable broad host range vector pBHR1 (MoBiTec; KmR, CmR) by excising a 1.6-kb BstBI fragment containing a MCS within the lacZ gene and the chloramphenicol resistance gene from plasmid pBBR-MCS1  and cloning it into the 4.5-kb fragment that resulted from cutting pBHR1 with BstBI. The resulting plasmids pBHR-MCS1 and pBHR-MCS2 contained the lacZ-cat insert in different orientations; only pBHR-MCS1 was used further. Next, a transcriptional terminator sequence encoded by rrnB was PCR amplified using primers rrnB-KpnI-fw (5'-TAAGGTACCCGGGGATCCTCTAGAGTCG-3') and rrnB-KpnI-rv (5'-CGCGGTACCAAGAGTTTGTAGAAACGCAAA-3'), which both included KpnI-site overhangs, and plasmid pSCrhaB1  as a template. The 472-bp PCR fragment was digested with KpnI and cloned into pBHR-MCS1. The correct orientation of the rrnB insert in the resulting plasmid pBHR1-MR was confirmed by PCR using primers rrnB-fw (5'-TCAGAAGTGAAACGCCGTAG-3') and cat1-rv (5'-ACGTGGCCAATATGGACAAC-3'). Next, a synthetic gene encoding a variant of the far-red fluorescent protein TurboFP635 (scientific name Katushka) was obtained from Source BioScience (formerly Geneservice). The variant turboFP635 sequence had been adapted to the codon bias of B. pseudomallei and was preceded by a SpeI site and followed by an EcoRV site. The 810-bp turboFP635 gene was cut from the cloning vector and cloned into EcoRV/SpeI restricted pBHR1-MR, resulting in plasmid pBHR1-RFP. Finally, a 443-bp fragment spanning the upstream region of the groES gene on chromosome I of B. pseudomallei strain K96243 (BPSL2698) was PCR amplified using primers groESprom-fw (5'-CTTGAGCTCGAACGTCGATTCGGACGCAT-3') and groESprom-rv (5'-GCGGACTAGTATTCACTCCTCTCTTTGATT-3'), which included SacI and SpeI restriction sites, respectively. The PCR product was cloned into pBHR1-RFP via its SacI/SpeI sites, resulting in plasmid pBHR1-groS-RFP (KmR, CmR). For use in intracellular replication assays, the kanamycin resistance cassette of plasmid pBHR1 and the derivatives described had to be eliminated by the following method. Firstly, unmethylated pBHR1 plasmid DNA isolated from a dcm-/dam- E. coli strain C2925 (New England Biolabs) was cut with StuI/PpuMI, which resulted in a 1.2-kb fragment encompassing the kanamycin resistance cassette and a 4.1-kb plasmid backbone fragment. The 4.1-kb fragment was treated with T4 DNA polymerase (Promega) according to the manufacturer's recommendations and re-ligated overnight at 15°C resulting in plasmid pBHR4 (CmR). Finally, a 1-kb fragment representing the cat gene of plasmid pBHR4 was replaced by a 3.2-kb fragment of plasmid pBHR1-groS-RFP, which encompassed the RFP gene linked to the groES promoter, the rrnB terminator and the cat gene, via BstBI restriction as described for the construction of pBHR-MCS1&2. This resulted in plasmid pBHR4-groS-RFP (CmR). Burkholderia uptake and survival were quantified utilising a modified kanamycin protection assay. An overnight culture of bacteria was pelleted and resuspended at 1 × 106 cells/ml in Leibovitz L-15 medium supplemented with L-glutamine and L-Amino acids (Gibco). The bacterial suspensions were then added onto J774A.1 murine macrophages that had been seeded at 1 × 105 cells/ml in 24-well plates, thereby resulting in a multiplicity of infection (MOI) of 10:1. The monolayers were incubated at 37°C for 2 hrs to allow bacterial internalisation to occur. Cells were washed with PBS and L-15 medium containing 250 μg/ml kanamycin was added to suppress the growth of extracellular bacteria. At appropriate time points, cells were washed with warm PBS and lysed in 0.1% Triton X-100 in PBS for 5 mins. The lysis mixture was diluted and appropriate dilutions plated out on LB agar plates which were then incubated overnight at 37°C to allow bacteria to grow. All experiments were performed in triplicate with three technical replicates each. Culture supernatants were harvested from infected J774A.1 macrophage monolayers at various time points as described above. The LDH assay was carried out using a CytoTox 96 Non-Radioactive Cytotoxicity Assay according to the manufacturer's protocol (Promega). Results were analysed using a Biorad Model 680 plate reader at OD 490 nm. Supernatants from uninfected macrophages were used as a control and the observed OD 490 nm readings were subtracted from the sample readings in order to correct for the background. All experiments were performed in triplicate with three technical replicates each. J774A.1 macrophages were infected as already described. At appropriate time points, cells were washed with PBS and acid ethanol treated (5% acetic acid (v/v), 5% dH2O and 90% Ethanol (v/v)) for 30 mins at room temperature. Cells were thoroughly washed with PBS and stained with Giemsa solution (0.1% w/v) for 30 mins at room temperature. After washing with dH2O, cells were allowed to dry before being visualised under a light microscope. At least 10 fields per view at 10 × magnification were analysed for the percentage of MNGCs, where a cell was considered a MNGC if 3 or more nuclei were present. J774A.1 macrophages grown on glass coverslips placed at the bottom of 24-well plates were infected with Burkholderia strains transformed with plasmid pBHR4-groS-RFP at an MOI of 10 as already described. At appropriate time points, cells were washed three times with warm PBS and fixed with 4% paraformaldehyde for 15 mins at room temperature. Cells were washed three times with PBS for 5 mins each before permealising the cells with 0.1% Triton X-100 in PBS for 30 mins at room temperature. After three more washes in PBS, filamentous actin was stained with 1 μg/ml FITC-phalloidin conjugate solution (Sigma) in PBS for 1 hr at room temperature. After several washes in PBS to remove unbound phalloidin conjugate, coverslips were mounted onto microscopy slides using Vectashield mounting medium containing DAPI (Vector Laboratories). Samples were analysed using a ZEISS LSM510 Meta confocal-laser scanning microscope. Wax moth larvae (Galleria mellonella) were purchased from Livefood UK Ltd (Rooks Bridge, Somerset, UK) and were maintained on wood chips in the dark at 15°C until used. Bacteria from overnight cultures were adjusted to a known concentration in PBS and a Hamilton syringe was used to inject 10 μl aliquots of this suspension into G. mellonella larvae. Injections were performed into the haemocoel of 10 larvae per bacterial strain via the foremost left proleg. Control larvae were either injected with 10 μl of PBS in order to measure any potential lethal effects of the injection process, or not injected to measure the effects of the incubation procedure. After injection, larvae were incubated statically at 37°C inside petridishes and the number of dead larvae was scored periodically. Larvae were considered dead when they displayed no movement in response to gentle prodding with a pipette tip. To determine intracellular bacterial numbers, infected larvae were placed on ice for 20 mins before the bottom 2 mm of each larva was aseptically removed and the haemocoel was drained into a sterile 1.5 ml microcentrifuge tube on ice. This was then serially diluted in LB medium and appropriate dilutions were plated out onto LB agar plates supplemented with gentamicin, which were incubated overnight at 37°C to allow bacteria to grow. All experiments were carried out in triplicate. Differences between mean values were tested for significance by performing unpaired, two-tailed Student's t-tests using the GraphPad Prism software version 5.01 (GraphPad Software, San Diego California USA). MEW, RWT and SLM were funded by the Ministry of Defence (grant number DSTLX-1000026866). CMM and RWT were funded by the Wellcome Trust (grant number WT085162AIA). MEW contributed to the experimental design, carried out the experiments and drafted the manuscript. CMM has constructed the fluorescent reporter plasmid and coordinated and edited the manuscript. RWT participated in study design and coordination and contributed to the manuscript. SLM conceived and coordinated the experimental design of the study and contributed to the manuscript. All authors read and approved the final manuscript.